Looking for the best duck hunting load? Blind Side® ammunition from Winchester® is the most innovative and anticipated steel waterfowl load in the company’s history. When you are going duck hunting you want to spend the extra money and buy the best load you can. You need to make each shot count. Blind Side looks to be one of the best performing non-toxic loads in Carducci Tactical’s opinion. Winchester calls this duck load Hex Shot. Why? Because this ammo is cube-shaped or technically a hexahedron shape with six flat sides. This steel waterfowl load is designed to hit waterfowl like “high-velocity tumbling bricks – creating massive wound channels, preventing over penetration, and maximizing energy deposit and knock-down shock within the bird.” The cube-shape allows Winchester to efficiently pack more shot into the wad shot cup to give you more pellets per shell. The packing density also gives Winchester more room to increase the powder charge and deliver increased velocity. These aren’t your daddy’s old steel waterfowl loads with no power. If I had to describe this new duck load, I would use the word tight. It was an impressive group at 35 yards with my 10 gauge shotgun. 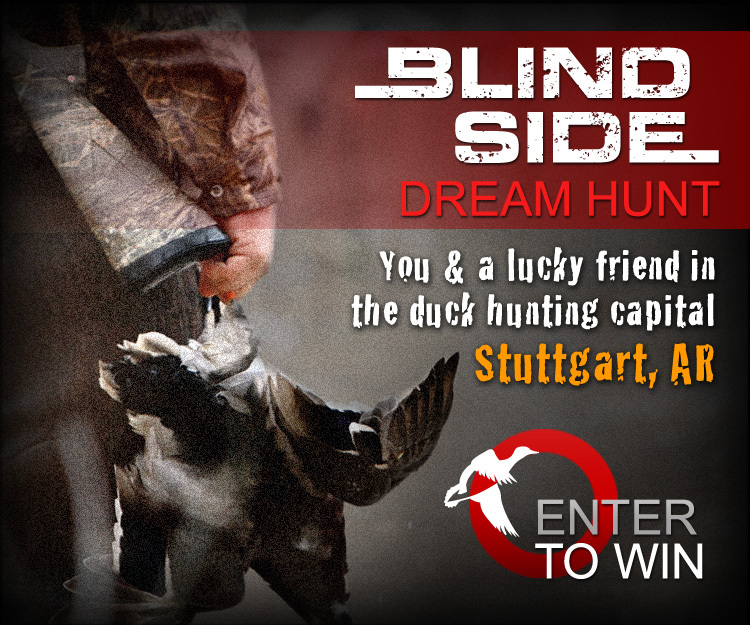 Blind Side is hitting store shelves across North America and Winchester has announced a fantastic chance for customers to win a waterfowl “dream hunt” and more. Partnering with RNT Calls, Winchester is offering one lucky, Grand Prize Winner and a friend the chance to duck hunt in the waterfowl capital of the USA – Stuttgart, Ark. The Grand Prize winner will also receive two Winchester Super X3 shotguns, 10 cases of Blind Side ammo and duck calls from RNT Calls – for a total value of more than $10,000. 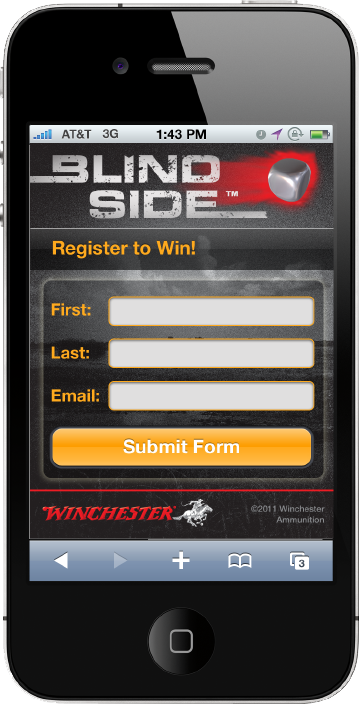 To enter the Winchester “Dream Hunt” Sweepstakes, text “Blind Side” to 81957 and fill out an entry form, or visit Winchester.com. The first runner-up will win a Winchester gun safe loaded with 10 cases of Blind Side ammunition and a second runner-up will also receive 10 cases of Blind Side. The deadline to enter is Nov. 28. The winner will be announced Dec. 1. With a heritage dating back to 1866, the Winchester brand was there for the taming of the American West, the Allied Forces’ victory in World War II and through the years, millions of fond memories made in the great outdoors. Known as The American Legend™, Winchester Ammunition is a global leader in sporting, law enforcement, military and personal defense ammunition production. Winchester continues to raise the bar with new products like Blind Side® waterfowl and PDX1™ Defender™ personal defense ammunition. For more information about Winchester Ammunition, visit Winchester.com, or connect with The American Legend at Facebook.com/WinchesterAmmunition. And, don’t forget to hit the range before the hunt and shot some clays with the new load. A hunter’s shooting skill is the main factor in his success. Take the time to practice. With a nice shotgun and this new load, you might just have your best hunt ever. Carducci Tactical always believes in any type of competitive shooting or hunting, that practice, a great gun and the best gear possible prepares you for success. Winchester won’t disappoint with this new waterfowl load. Try it out and let me know what you think. This entry was posted in Contests, Hunting, Product Reviews and tagged Best duck hunt load, Blind Side Steel Load, Carducci Tactical, duck hunt loads, Waterfowl Ammo, Winchester Ammo, Winchester Blind Side. Bookmark the permalink.